This 24 page 8 x 10" full softcover black and white book is packed 3D illustrations and photographs. Includes easy to follow instructions and a complete material list. Every family can use a safe room. A place in the home to retreat to in an emergency. Wouldn't it be great if the kids had a secret place to hide during a home invasion or burglary. Now you can utilize this attractive built in designed book cases to act as a hidden door into any area. These doors can be built by anyone with basic handy man skills. We have worked out all of the tricks that allow the bookcase to swing open yet still look like a custom built in cabinet when closed. This hidden bookcase door was designed to be built by any homeowner with basic carpentry skills. The door is easy to build yet will look like a custom made bookcase. This text is packed with images and how to information. Unlike other bookcase doors Mr Berg designed these plans to use standard heavy duty hinges. 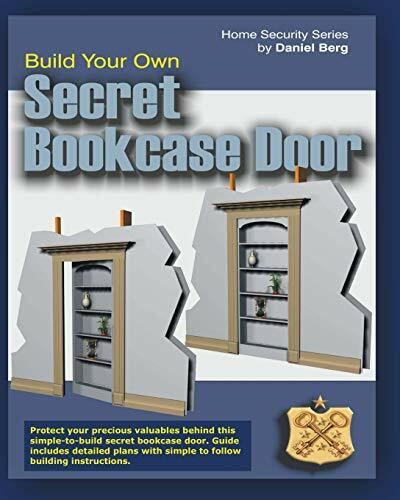 Now for only a fraction of the cost, anyone with basic wood working skills and a few tools can produce this great looking hidden bookcase door. Protect your valuables, conceal a closet or create a safe room. Check out the price of comparison custom units. Then set aside a week end and build your very own. This text contains all the information you will need.